The domain within your query sequence starts at position 1159 and ends at position 1200; the E-value for the NL domain shown below is 6.79e-13. The Notch protein is essential for the proper differentiation of the Drosophila ectoderm. 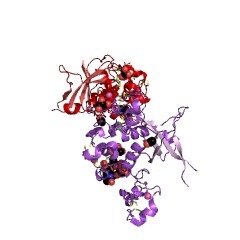 This protein contains 3 NL domains. 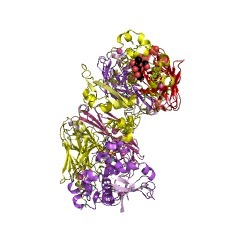 The Notch domain is also called the 'DSL' domain or the Lin-12/Notch repeat (LNR). The LNR region is present only in Notch related proteins C-terminal to EGF repeats. The lin-12/Notch proteins act as transmembrane receptors for intercellular signals that specify cell fates during animal development. 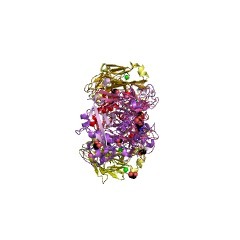 In response to a ligand, proteolytic cleavages release the intracellular domain of Notch, which then gains access to the nucleus and acts as a transcriptional co-activator [(PUBMED:3119223)]. The LNR region is supposed to negatively regulate the Lin-12/Notch proteins activity. 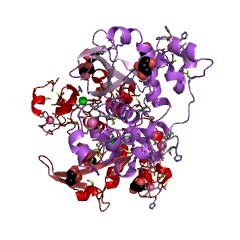 It is a triplication of an around 35-40 amino acids module present on the extracellular part of the protein [(PUBMED:7697721), (PUBMED:8139658)]. 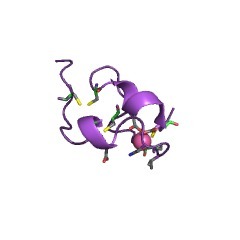 Each module contains six cysteine residues engaged in three disulphide bonds and three conserved aspartate and asparagine residues [(PUBMED:3119223)]. 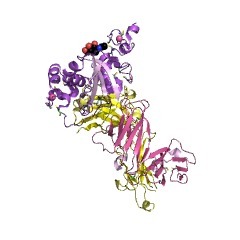 The biochemical characterisation of a recombinantly expressed LIN-12.1 module from the human Notch1 receptor indicate that the disulphide bonds are formed between the first and fifth, second and fourth, and third and sixth cysteines. The formation of this particular disulphide isomer is favored by the presence of Ca2+, which is also required to maintain the structural integrity of the rLIN-12.1 module. The conserved aspartate and asparagine residues are likely to be important for Ca2+ binding, and thereby contribute to the native fold. There are 7743 NL domains in 3057 proteins in SMART's nrdb database. Taxonomic distribution of proteins containing NL domain. This tree includes only several representative species. The complete taxonomic breakdown of all proteins with NL domain is also avaliable. Click on the protein counts, or double click on taxonomic names to display all proteins containing NL domain in the selected taxonomic class. The LIN-12/Notch signaling pathway and its regulation. Notch, LIN-12, and GLP-1 are receptors that mediate a broad range of cell interactions during Drosophila and nematode development. Signaling by these receptors relies on a conserved pathway with three core components: DSL ligand, LNG receptor, and a CSL effector that links the receptor to its transcriptional response. Although key functional regions have been identified in each class of proteins, the mechanism for signal transduction is not yet understood. Diverse regulatory mechanisms influence signaling by the LIN-12/Notch pathway. Inductive signaling relies on the synthesis of ligand and receptor in distinct but neighboring cells. By contrast, lateral signaling leads to the transformation of equivalent cells that express both ligand and receptor into nonequivalent cells that express either ligand or receptor. This transformation appears to rely on regulatory feedback loops within the LIN-12/Notch pathway. In addition, the pathway can be regulated by intrinsic factors that are asymmetrically segregated during cell division or by extrinsic cues via other signaling pathways. Specificity in the pathway does not appear to reside in the particular ligand or receptor used for a given cell-cell interaction. 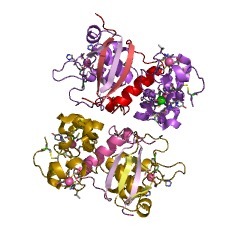 The existence of multiple ligands and receptors may have evolved from the stringent demands placed upon the regulation of genes encoding them. Sequence of C. elegans lag-2 reveals a cell-signalling domain shared with Delta and Serrate of Drosophila. The lin-12 and glp-1 genes of Caenorhabditis elegans encode members of the Notch family of transmembrane proteins. Genetic studies indicate that the lin-12 and glp-1 proteins act as receptors in specific developmental cell interactions and that their functions are partially redundant. lin-12 glp-1 double mutants display certain embryonic defects not found in either single mutant. The phenotype of this double mutant is called Lag, and recessive mutations in either of the genes lag-1 or lag-2 can also result in the Lag phenotype, indicating that these two genes may participate in the same cell interactions that require lin-12 or glp-1. We report here that lag-2 encodes a predicted transmembrane protein of 402 amino acids. The predicted extracellular region of lag-2 is similar to amino-terminal regions of Delta and Serrate, two Drosophila proteins that are thought to function as ligands for Notch. The region of similarity includes sequences related to epidermal growth factor (EGF) repeats. 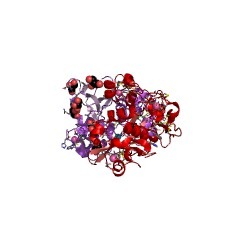 We have isolated lag2(sa37), a dominant allele that shows specific genetic interactions with lin-12. The sa37 mutation causes a Gly-->Asp change in a conserved residue of an EGF motif. Because of its overall structure, its sequence similarity to Delta and Serrate, and its genetic interactions, we suggest that lag-2 encodes an intercellular signal for the lin-12 and glp-1 receptors. glp-1 and lin-12, genes implicated in distinct cell-cell interactions in C. elegans, encode similar transmembrane proteins. Genomic DNA closely related in sequence to lin-12, a gene that specifies certain cell fates during C. elegans development, was isolated from a C. elegans library by low stringency hybridization. DNA sequencing of genomic and cDNA clones predicts the new sequence to encode an integral membrane protein that shares three repeated amino acid sequence motifs with the lin-12 product and the Drosophila Notch product: an epidermal growth factor-like motif, the "lin-12/Notch Repeat," and a motif present in two yeast gene products that have cell cycle dependent functions. Austin and Kimble (see accompanying paper) present evidence that this sequence corresponds to glp-1, a gene implicated in cell-cell interactions distinct from those involving lin-12. Possible implications of the predicted structure of the glp-1 product with respect to these cell-cell interactions are discussed. This information is based on mapping of SMART genomic protein database to KEGG orthologous groups. Percentage points are related to the number of proteins with NL domain which could be assigned to a KEGG orthologous group, and not all proteins containing NL domain. Please note that proteins can be included in multiple pathways, ie. the numbers above will not always add up to 100%.